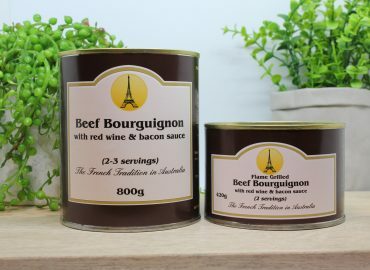 Pour an 800g can of FRANCK FOOD Beef Bourguignon in a sauce pan and place over medium to low heat. Stir occasionally. Once the Beef Bourguignon is simmering, take the pan off the heat. 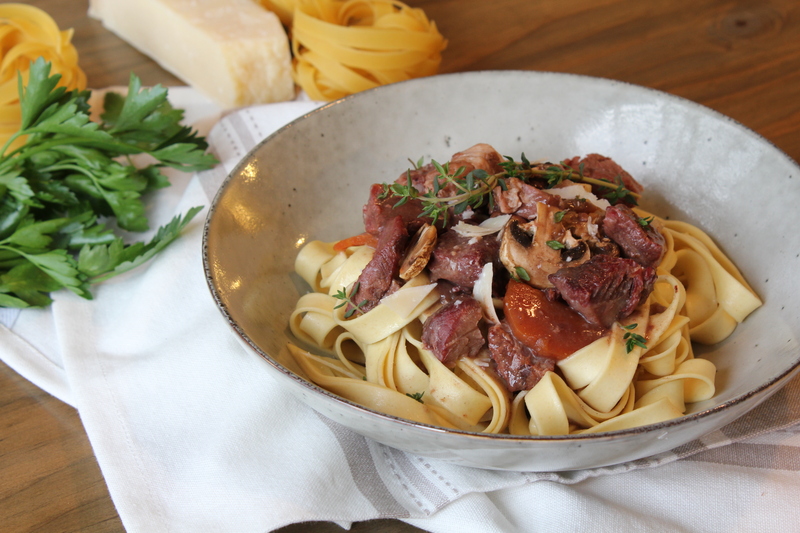 Take the pieces of beef out of the sauce and set aside. In the meantime, heat the olive oil in a pan. Add the onions and mushrooms and cook until nice and soft. Add the onion and mushrooms to the sauce, mix well and let simmer on low heat for 5 minutes. Place a serve of pasta into each plate. Add the beef pieces and pour a generous amount of sauce over. To serve, add some freshly shaved Parmesan cheese, fresh thyme and parsley.